“Brewed Under License” is the beer industry’s way of describing out-sourcing. This is either done when a brewery lacks the capacity to do all their own brewing – Brewdog being a recent example, temporary farming out production of Punk IPA to Thwaites – or as an alternative to exporting their beer. This second example makes a lot of sense, on paper. Beer can have a relatively short shelf life, and being a product which is (a) mostly water, and (b) often wrapped in heavy glass, it’s not exactly ideal for shipping half way around the world. Far better, it would seem, to find a local partner in your destination country and get them to make the beer for you. The trouble is, once you let someone else make your beer, it’s no longer your beer. You can paint the best copy of the Mona Lisa in the world, but nothing makes it a da Vinci painting, even if Leonardo himself licenses his name to you. Of course, if you’re just wanting to enjoy the artwork then what matters is how it looks, rather than who held the paint brush and the same is true of beer. That brings me to my other worry – just how good a clone can you brew when you’re half-way around the world from the brewery where it was born? This was all lurking in my mind a few months ago when Asahi – brewed in the UK by Shepherd Neame – came up on Twitter, and I mentioned that I kept meaning to get hold of some Japanase imported Asahi to compare. John Humphreys (no, not that one – the one who works for Shepherd Neame) quickly responded to my pondering and in no time, I had a genuine Japanese bottle in my hands, ready to be compared. The Japanese version is clearly the better bottle! The first thing to observe is that the Japanese really know how to package a beer. None of this agonising over whether bottles or cans are better – they simple make bottles out of aluminium. It’s a packaging format I love, but I don’t think I’ve ever seen it in this country so for the UK version, I’ve taken the glass bottled route. It’s worth noting, by the way, that although the labelling is almost identical the Kanji in the middle is different. Thanks to Google, I’m pretty sure that the Japanese version says “genuine”, while the licensed version has gone for “dry” (although, my translation also offers “salty” and “harsh” as alternatives!). 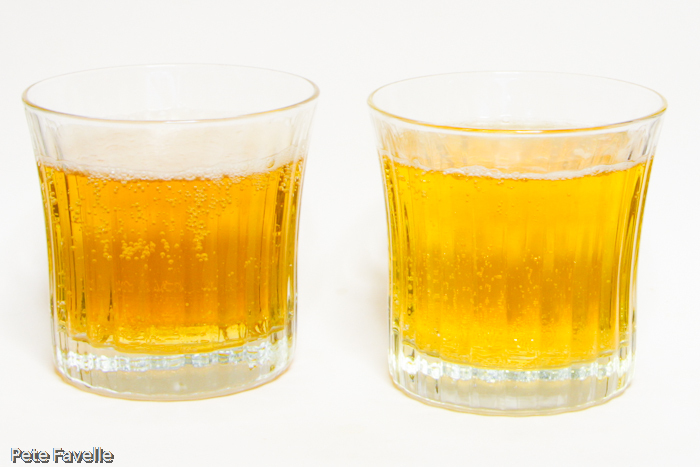 Visually, the imported version is marginally darker, and the carbonation is a touch finer – smaller bubbles and a slightly more lingering head, while the licensed version has more of a ‘cidery’ look about it. The aroma of the import is quite malty; sweet, well toasted grain and an undercurrent of wet earth. The UK version is harsher, less sweet with a more mineral character. The difference is once again marginal, however – if I didn’t have them side by side it would be tough to call it between the two. In the mouth, the import shows that finer carbonation with a creamy, champagne texture as and an initial honey sweetness that slowly yields to a gentle, soft bitterness that lingers delightfully. The licensed version starts with a similar texture, a far softer and more delicate body than the bigger bubbles lead me to expect. However, it lacks that honey sweetness at the start, and the rising bitterness feels like it comes more from the carbon dioxide than the hops; it’s harsher and more fleeting. This isn’t a completely fair fight, because they’re in different containers – from previous experiments I know that can affect things like carbonation. 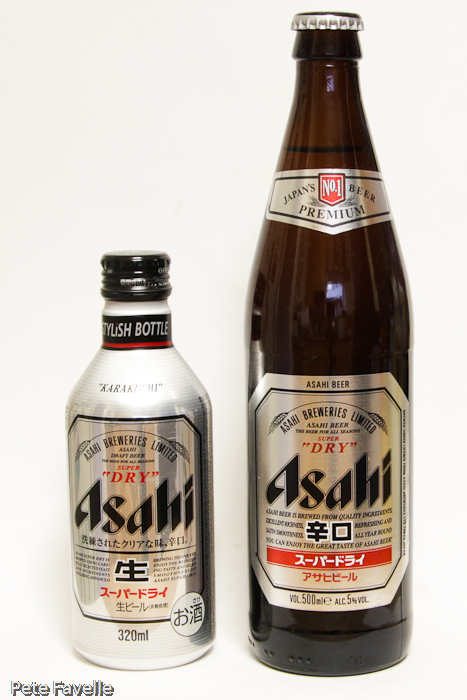 I also have to say that the differences are marginal and having drunk plenty of Asahi both in the UK and in Japan, I would have a hard time spotting the difference if I didn’t have them side by side. Given the choice I’ll take the imported version every time. Many thanks to John Humphreys for getting hold of the Japanese Asahi for me! Interesting. You would expect Volkswagen to be able to turn out the exact same Golf in a factory thousands of miles from Germany, and likewise a can of Coke. Is there maybe something specific and local about the fermentation process for beer? Having said that, for any beer with significant volume, local licence-brewing makes much more economic and environmental sense. But they are (generally) the same company – it’s more like expecting that Golf to roll out of a Vauxhall factory. I do wonder if breweries tailor their licensed recipes for local tastes? Here in Australia it is considered a rip off to brew someone elses beer in a different country. Our water is terrible for making beer ( except Coopers ) and to if your expecting anything close to a Becks or a Heineken you will be sadly disappointed, the taste does not even remotely resemble whatever may be written on the box, the price strangely remains very over inflated though. Interesting; water treatment in large breweries is pretty sophisticated these days though, I wonder if the taste difference is more about tailoring the product to the perceived local market?